MLD is an acronym for Microscopic Lumbar Discectomy. Microscopic refers	to the use of a microscope or magnification system. Lumbar refers to the	five lumbar segments of the low back. Discectomy refers to removal of	the herniated part of the disc. Patients with disc herniations are candidates for an MLD. The disc herniation	causes compression on local nerves which can then cause pain, weakness	or numbness/tingling down the leg. Think of the disc herniation or bulge	as a pebble in your shoe. It needs to be surgically removed in order for	the compression upon the nerve to be relieved. The surgery is designed	to shave a little bone, remove soft tissues (such as ligament), and excise	loose disc fragments all through approximately a 2cm incision in the back. The end result will be to open up the local space around the affected	nerves thereby allowing them to function more properly. Ninety-six percent of our patients have had pain reduction with an MLD	procedure with an average pain reduction from 7/10 pre-op to 2/10 post-op. This is a case of a 34 year-old female with progressive low back and right	leg pain and weakness. The pain radiated into her right buttock, back	of her thigh and calf, and onward towards her heel and outside part of	her right foot. She also noted weakness on her right side with the push	off phase of walking. 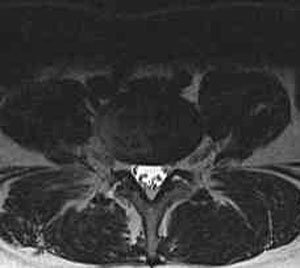 She had an MRI that demonstrated an eccentric to	the right disc herniation at L5-S1 (Figure 1). Figure 2 demonstrates her	normal L4-5 disc level. She had failed non-surgical management in the	form of medications, injections, and physical therapy. She ultimately	underwent a MLD on the right at L5-S1 with immediate relief of her right	leg pain. Figure 3 displays the small surgical incision. Figure 2. 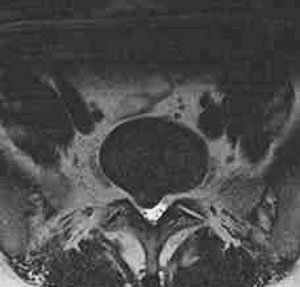 MRI image through L4-5 demonstrating a normal disc. Figure 3. 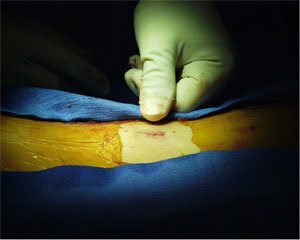 Surgical incision of 2 cm in length.